Why have we established the FPMT? Why are we establishing these facilities all over the world? I think we are clean clear as to our aim – we want to lead sentient beings to higher education. We are an organization that gives people the chance to receive higher education. We offer people what we have: the combined knowledge of Buddha’s teachings and the modern way of life. Our purpose is to share our experiences of this. Now, the way we have evolved is not through you or me having said we want to do these things but through a natural process of development. Our organization has grown naturally, organically. 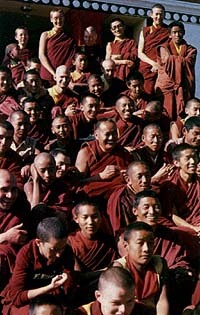 It is not “Lama Yeshe wanted to do it.” I’ve never said that I want centers all over the world. Rather, I came into contact with students, who then wanted to do something, who expressed the wish to share their experience with others, and who then put together groups in various countries to share and grow with others. Personally, I think that’s fine. We should work for that. We are human beings; Buddhism helps us grow; therefore, it is logical that we should work together to facilitate this kind of education. And it is not only us lamas who are working for this. Actually, it is you students who are instrumental in creating the facilities for Dharma to exist in the Western world. True. Of course, teachers help. But the most important thing is for the students to be well educated. That is why we exist. When we started establishing centers there was no overall plan – they just popped up randomly all over the world like mushrooms, because of the evolutionary process I’ve just mentioned and the cooperative conditions. Now that all these centers do exist, we have to facilitate their development in a constructive, clean-clear way; otherwise, everything will just get confused. We have to develop properly both internally and in accordance with our twentieth-century environment. You can read more about the principles of FPMT’s unique Wisdom Culture.